Charles Barry is, by every measure, an immense figure in 19th-century British architecture-by the scale of his output, the intensity of his energy, and the extent of his artistic influence. In stylistic terms, he was an impressively versatile designer, capable of Gothic, Jacobethan, Greek Revival and Scottish Baronial architecture. Indeed, he regarded style as a trapping that an accomplished architect could assume at will. His principal achievement, however, was the introduction to Britain of an Italianate Renaissance style. To a public confronted in the late 1820s by the extremes of Greek Revival and Gothic architecture, this was a welcome alternative in which to build. This Italianate style, adopted in countless terraces, clubs and town halls, became the most popular in Victorian Britain. Barry’s buildings are distinguished by their imposing outlines, assured planning and careful attention to decorative detail. Born in 1795, the son of a prosperous Westminster stationer, Barry was articled at the age of 15 to a Lambeth firm of surveyors. His experience in the firm, which he later came to manage, gave him a practical grounding in architectural work. Drawing also fascinated him and, as a boy, he used the walls of his bedroom-which were periodically repapered-for his sketches. When Barry came of age, he used a small inheritance from his father to educate himself further through travel. Between 1817 and 1820, he journeyed as far afield as France, Italy, Greece, Malta, Cyprus, Turkey, Egypt, Syria and Palestine. His surviving notebooks record in detail what he looked at and admired. The commission that first raised Barry to celebrity was the Travellers Club on Pall Mall (1829). Cast in the form of a Renaissance palazzo in Rome or Florence, it stood in striking stylistic contrast to other public buildings of its kind in England. A few years later, in 1837, he designed the neighbouring Reform Club in broadly the same form. In 1836, Barry won the architectural competition of his generation: the reconstruction of the Houses of Parliament. This huge project-at the time perhaps the largest and most complex ever undertaken in Britain-was to absorb Barry’s energies for the rest of his life. To drive it forward, he reputedly slept for only five hours every night. Meanwhile, the politics and diplomacy of the work tested his reputation for geniality to the limits. Barry was knighted in 1852 after the Royal Entrance to the new palace was used for the first time, but he died before the buildings were complete. They were finished by his son, Edward Middleton Barry. Within the constraints imposed by the demands of the rebuilding of Westminster, Barry also carried out private work. 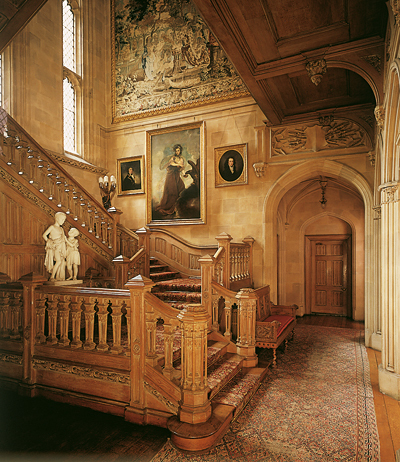 His country-house projects typically involved the enlargement of an existing building in any style that pleased his patron: Jacobethan at Highclere (1839-49), Scots Baronial at Dunrobin (1844-50), or Italianate at Harewood (1843-50) and Duncombe Park (1843-51). In the course of such work, he also indulged his fascination for landscape gardening. His favoured approach-as at Shrubland Park, Suffolk, from 1848-was to lay out terraces around the house and create progressively informal plantings beyond until the garden opened into parkland. Barry died on May 12, 1860, at his house on Clapham Common, and was buried in Westminster Abbey.